Goodreads appetizer: Unemployment, despair, anger--visible and invisible unrest feed the undercurrent of Detroit's unease. A city increasingly invaded by phantoms now faces a malevolent force that further stokes fear and chaos throughout the city. 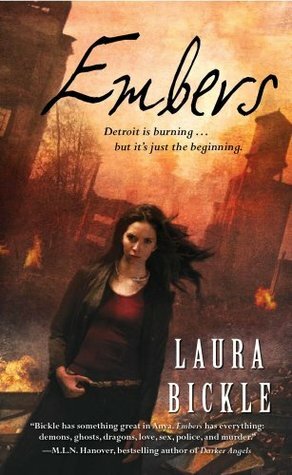 This review was originally posted on Book Lovers Inc.
My Thoughts: Embers is the first book in the gritty and dark Anya Kalinczyk urban fantasy series, and despite it being Laura Bickle's debut novel she had me entranced in the story from the very first pages. Anya Kalinczyk is an arson investigator and I was amazed at all the details that Laura Bickle included in the story of the different procedures, clues fire investigators examine. I kept thinking that either Laura Bickle knew what she was writing about due to her own professional experience or if not, then I was in awe of the amount and depth of her research. She kept all the information and explanations interesting and not too complicated for people unfamiliar with this field, yet gave enough knowledge and detail to give a solid base for the reader to understand the workings of fire and arsonists. I think that until Embers I've only read light UF, and though the darkness of Anya's world was unfamiliar I was spellbound from the start. Despite the gritty, gloomy atmosphere of the story Laura Bickle manages to create a complex and real universe: her characterisation is spot on with layered, threedimensional, larger than lifecharacters who step off the pages; thanks to the detailed descriptions the setting of Detroit appears before the eyes of the reader (even though I have never been there) and the mystery and chase are exciting enough to induce nailbiting and heart-pounding in every reader. Besides the very interesting character of Anya, I enjoyed that the supporting characters were just as well developed even if they got much less "screen time". And of course there is Sparky, the fire elemental salamander, loyal friend and protector of Anya. *sighs* Sparky is the most wonderful fictional pet I have ever come across. He is sweet, loyal, fierce, adorable and funny, I couldn't imagine Embers without him! And talking about characters I have to stop and mention the two male main characters: Brian and Drake. Brian is the geeky good boy next door. He is warmhearted and shy, while Drake is the irresistible dark and handsome bad boy hero exuding that thrilling vibe of danger and wildness. You couldn't find two men more different than these two and yet the reader can completely understand how Anya is pulled towards both of them and what is the attraction of each one of them. I can only applaud Laura Bickle for not patronizing the reader by giving a black and white cardboard villain but making such layered characters towards whom the reader can't help but feel ambivalent. Laura Bickle has a way with words. Her story flows naturally and she plays the tension throughout the novel as a master conductor directs its orchestra: brilliantly. Besides the constant darkness of the plot, she eases the strain with sparkling humour which makes an appearance when least expected. Anya's sarcastic dry humour and Sparky's wonderful cuteness lighten the mood a bit and ensure not to let the story cross over into bleak territory. The ending was beautiful and poignant. With the final emotional climax I couldn't help my throat closing up and I felt my heart constrict. It was such a powerful ending that I not only got goosebumps but felt hot and cold at the same time. Verdict: Laura Bickle's rich and poetic writing with her detailed descriptions and witty humour will keep you spellbound all through the story. Embers is a wonderfully vivid and emotionally deep urban fantasy novel, and Laura Bickle proves that she is an author not only to watch but to put on your auto-buy list!